The more I use CTMH’s Cricut Art Philosophy Collection…the more I LOVE it! 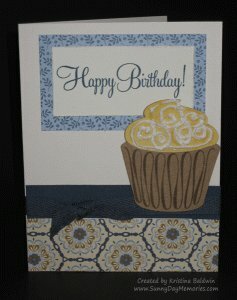 I made this card by cutting out the cupcake image in both our Kraft Cardstock and our now retired Mayberry papers. Then I used the Art Philosophy Celebration Stamp Set included in the Cricut Collection to stamp both cupcakes and did a little paper piecing to get a fun cupcake that would match beautifully with our *NEW* Pemberley papers. Aren’t these Pemberley papers just so beautiful?! Honestly, I think I love them more in person (isn’t that always the case?) So which of the new paper packs in CTMH’s Spring/Summer 2012 Idea Book is your favorite? Leave us a comment and let us know! This entry was posted in Card and tagged Cricut Art Philosophy, using clear stamps card making. Bookmark the permalink.